We groom 20?30 kilometers of trails for cross-country ski and snowshoe enthusiasts. Both skate-ski lanes and classic tracks are maintained daily. Our conditions predictably offer blue wax conditions much of the winter. With advanced notice and an additional charge, we are happy to arrange guided ski and snowshoe tours, and provide ski lessons on the ranch. Three primary trail systems depart from ranch headquarters and head deep into the Basin. Our terrain offers a variety of ski challenges, but the most effortless trail, Willow Way, rolls south past the horse arena. The route crosses Tom Miner Creek and continues on a 6.5 kilometer loop. For an easy kilometer, the trail wends through willows and an open meadow, then among a distinctive aspen grove. Hidden in the willows, the Davis Cabin homestead still stands, a tribute to a family that arrived in the Basin in the early 1900s. Inside are remnants and evidence of a homesteaders rugged, bucolic life. Willow Way cruises another kilometer to meet the Anderson Trail, which is a straight shot, slightly downhill ego-boosting cruiser back to headquarters. Another short trail leads south from this junction to the Anderson Cabin, a one-room warming hut. Terrain is similar although once out of the aspens and alders, views of the 10,300-foot Ramshorn Peak, Twin Peaks, Sheep Mountain, Specimen Ridge and Yellowstone's boundary suddenly appear. Intermediate skiers find the Skully Trail system initially challenging, then delightful. The track heads west and after maneuvering past a frozen pond and between large aspens, the trail connects to Tini's Revenge. En route, skiers wonder if the devilish .3 kilometer, 400-foot climb is truly worthwhile. It is. Once at the Skully Tent, Mountain Lion Run trail and Skully Loop head off through timbered and rolling terrain. The fast ski back down from the tent is a .3 kilometer speed run for thrill seekers and skiers with powerful snowplows. The more challenging Reed Sawmill Trail climbs en route to a cabin that was once part of the Reed family sawmill operation. A nearly 10 kilometer round trip in the Pine Creek drainage, this trail offers scenic views of Paradise Valley, Emigrant Peak, and the lower portion of Tom Miner Basin. The trail ascends through summer pastures and into wooded Middle Creek drainage and continues to climb to the Sawmill Cabin at 7,400 feet. 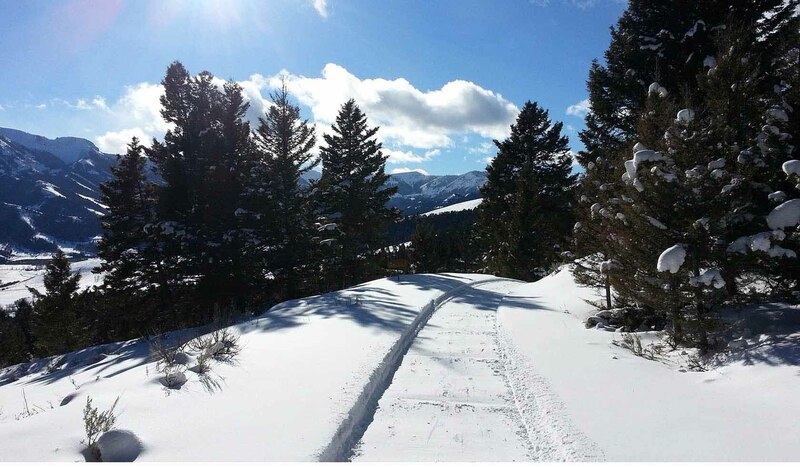 The return trip offers fast downhills, banked turns and views of nearly the entire ranch. The ranch has numerous pairs of adults and kids snowshoes but no ski rentals. Ski equipment is available in Livingston at Timber Trails (406) 222-9550 and in Bozeman at Northern Lights (406) 586-2225 and Bangtail Sports (406) 587-4905.